Used in electrical enclosures for wire access points, knockouts are very common in sheet metal fabrication. Knockouts are created by punching a slug that is usually displaced slightly by the material thickness and held in place by small uncut tabs. The retained slug can easily be removed (or “knocked out”) at a later time. 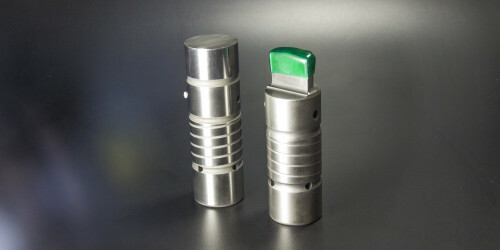 Knockouts may be formed up or down, determined by the requirements of the finished product and manufacturing process. Many knockouts fit within the ranges of the punch press station sizes, so the typical knockout process uses a single tool to create the slug and tabs. Sometimes, however,the finished product requires knockouts that are either larger than possible to make using the available stations or the tonnage required is too high for the machine. Following are some ways to accomplish making these over range or over tonnage knockouts. Segmented or multiple knockouts are probably the best way to handle these situations. While they won’t be as “pretty” as one formed by a standalone knockout tool, they get the job done. An additional advantage of segmented or multiple knockouts is that they reduce the tonnage required, so it is easier on your machine. The photo shows a large 4.00”(102,00mm) knockout that was made using the segmented method. The tool design places the tabs at specific locations to facilitate removal. A variation of the segmented knockout is an arch bridge lance and form. With this tool, each edge of the arch is chamfered to help overlap the hits and minimize distortion.